Is the way that time passes in fortress mode ever going to change? Or did you already put a ring on it? Thanks for all the tireless work, Toady! the current tantrum and insanity systems are "placeholders" but do you have a broad-strokes idea of what needs to be done before this part of the AI (artificial insanity) engine is fleshed out? I would love to see someone actually appoint a yak to a noble position and mean it! This would be a legitimate loyalty cascade between loyalty to the noble and loyalty to the country. I'm not really sure how it should work at this point. Once we get the new stress/stability system in, it'd probably just be the sort of thing that can be addressed directly. The easiest way would probably be to assign specific issues to people that have been having trouble for a while, but I have no idea if that's something that should happen. That means it's actually closer than I thought. Once Dwarves get mounts, we'll have citizens tilting as windmills in no time! The personality change/shifting standards/acclimation question has been sitting on the table for a long while, but I haven't much with it yet -- we did do that thing with dwarves getting tired of specific food/drink types, and a few other individual counters, though having dwarves get tired of craftsdwarfship would be a sad, angsty thing. General changes in personality have to be approached more carefully, and I'm not sure when we'll try to actually shift a facet. It happens a lot in real life (just growing up mostly, though kids should start with way more out of whack facets), but facet changes need to occur through a clear process so it isn't mushy and confusing and character-killing, especially since we are using the emotions in part to more clearly establish the dwarves as distinct characters. 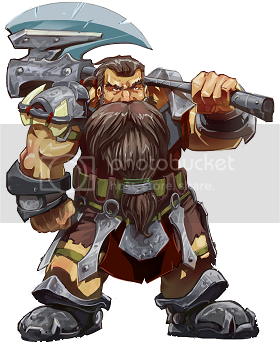 I can see a Dwarf getting tired of performing the same exact job over and over and over again like smelting copper (absent a preference for copper) but I imagine getting tired of crafting would require some very outlier values for a Dwarf. By the way, she's in my current fort. As for growing up emotionally, do you envision this being part of the caste-like life stages currently planned? Or are you more interested in researching how people really mature? One result I found fascinating is that teens understand risks just fine but that they vastly over-estimate the benefits from risky behaviors. What are the 119 emotions? People have a guessing thread now, so we'll have to wait! Aw, oh well, we can wait a little, guessing is fun anyway. how are living encampments and search posses going to be implemented in the current frame? Right now tents are just fancy backdrops for either unjustified murder or meaningless, one-sided interactions, what with their occupants being always asleep. Haven't commited enough crimes in a single savefile to provoke manhunts against me, but I think they're non-existant by now. I might be wrong. Yeah, it ended up poorly -- tents became trouble during development, and I'm still not sure how to have them packed up and so on while armies don't even have equipment. Many armies just don't stop and hang out during the day -- they only stop and instantly sleep, so it is a weird setup. There are guards in the camp that wander around at night, so it shouldn't be utterly one-sided. I'm not sure what's going to happen, but a lot more work needs to be done with army movements and intent and supplies and messengers and all that. The search posses themselves would be easier to fix. I've seen posses in towns during testing, but I don't think the camps can do them despite what I had hoped for. And they are just an army on the map, so it'd be good luck to even notice that a town was hunting you. Can't you at least try to do something about the sleeping forever part? Valtams point is that they contribute nothing to the whole adventure mode experience if they sleep forever. As for the posses, I think I actually had a few of those while I was killing off an isolated dwarven civ since a hillock (and possibly a fortress) actually sent a few soldiers to try and kill me. Wasn't sure if they were bandits since they sort of acted like bandits, but then I decided that they were posses. In a more recent adventure save, I killed an ambush which was hostile to me near a town and then when I approached the hamlet, a new one ran out (also hostile), which I killed. Then when I went into the hamlet, the first person I talked to called me a murderer (I'd never been to that town before). Not sure if that was because I killed the second group that went after me or some other reason, but I decided that I just wasn't welcome there and went elsewhere. There was some blood on my weapons, not sure if that counts too. Either way, I got the feeling that I just wasn't welcome there. I keep trying to click these words but nothing happens? The many words thing for snow is actualy a myth. Like in german the natives up in the north use compound words. In german you have something like "Pulverschnee" which means very powdery snow. Psychiater, Psychologe, Psychoonkel/Psychotante (if female), Nervenarzt, Seelenklemptner, Püschologe, Psychotherapeut and "Facharzt für Geistes- und Gemütskrankheiten "
The ones for Philosopher ... again tons of compoundwords. I wonder though too what the 120 states of mind will be. Are you trying to hint 'link the bug report'? Also, fixed with links that shall activate at your click. The magma is seeping under the door. I have an idea. Let's play a game where you win by being as quiet as possible. I get it, it's one of those games where losing is fun! I spend most of your dimension's time outside of your dimension. I can't guarantee followup or followthrough on any comments, ideas, or plans. Also edited the post to link to the animal recruit bug because the second one happens to include that, and linked the save in the report itself. I hope these broken adventure mode features that were promised in the last development cycle (camp invasions, searching parties, and so on) are dealt with sooner than later. They looked really cool. "Toady One and ThreeToe express the emotion of 'gratitude.'" Heheh, I'm just thinking of how this will look in game. "Urist expresses the emotion of 'berzerk'." PerfectWorldDF World creator utility for Dwarf Fortress. Well, Finnish already has a few words for different kinds of snow that don't translate directly, even though we do have a powder-snow compound too, not to mention the somewhat more scientific terms for different shapes of snow crystals, which are also compounds and probably direct translations (to?/)from English. Nuoska, tykky, and hanki come to mind. And the Sami and other reindeer-herding probably do have a few more... each. Oh, and those 3 were words for different kinds of snow on the ground. There's several words for snow falling too, even if the basic version is just "it's raining snow" (the direct translation-equivalent of "snowing", "lumettaa" is only used for when skiing slopes etc make/spread artificial snow). Long way of saying that it's not as much of a legend as you might think. Of course some translation can almost always be made, but you end up losing some of the meaning that usually only natives understand.